Our new communication system will keep you alerted in the case of an emergency. 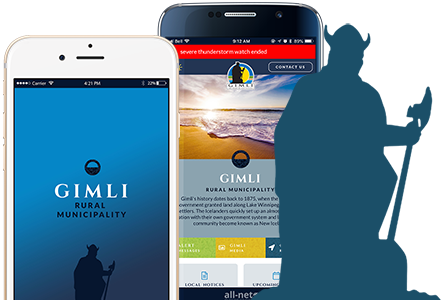 Register with us and never miss out on the latest news, upcoming events, emergency alert messages from Canada's national emergency alerting system (Alert Ready), and weather for the Rural Municipality of Gimli. Our iPhone & Android Apps! Our iPhone and Android apps can be downloaded for free to provide residents and visitors with immediate access to local weather, council meeting minutes, council meeting agendas, local notices, community events, local maps, service request submissions, business directory and push notifications and emergency alerting. Truly one of Manitoba's natural beauties, Gimli has built a great reputation while hosting vacationing families and national and international conferences. Our vast sandy beaches and relaxing environment make Gimli a great place to relax, enjoy and vacation.